This morning at the science meeting, Chief Scientist Rhian Waller expressed that, even though we’ve had blustery weather conditions the last few days, most of the scuba dive and sample collection goals have been met making this scientific cruise a huge success! It’s nice to be able to take a deep breath and realize the science objectives are going to be met before deadline! Everyone’s hard work has paid off. We are all glad for the exceptionally clear skies and good weather during the first half of the cruise. Rain, snow, fog and wind have been the environmental setting for R/V Norseman II in Glacier Bay this weekend. I am hoping to get to go back out on the little dive boat today or tomorrow one last time, even though it’s a bit choppy out there. Yesterday, the scuba divers brought up some more fascinating samples from their dives! Amongst the curious creatures were beautiful sea stars, a jellyfish that reminds me of a jam-drop cookie, a big yellow nudibranch, a fat-looking brown sea cucumber and a one-armed sea star! The one-armed sea star was alive and moving. Did you know that sea stars have the ability to regenerate missing body parts? So this one-armed guy will grow another body! Hard working scientists, divers, and crew members need good food to sustain their abilities to concentrate and do the physical labor. 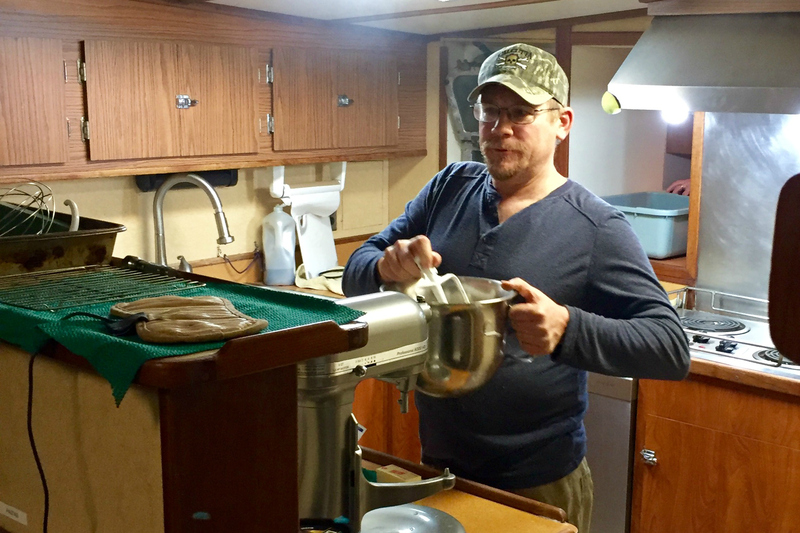 Thanks to our ship’s cooks, Harry and Darrin, we have an abundance of delicious and healthful food choices prepared daily onboard the R/V Norseman II. As each mealtime approaches I look forward to finding out what these two guys have whipped up to serve everyone onboard. According to Head Cook Harry, who is a retired Navy cook with over 26 years of cooking experience, the biggest difference in meal preparation on a ship is the scale. They are preparing four full meals a day for 23 people in a small kitchen! Their shifts are from 7 to 7. Harry works the day shift preparing lunch and supper. Darrin, the assistant cook, works the night shift preparing midnight meal and breakfast. You may recognize names of some of the famous chefs that Darrin has worked for during his off-season: Emeril and Chappy. The biggest challenge is planning the meals for 14 days without being able to go to the grocery store if something was forgotten. One thing Harry never, ever forgets is coffee. There must be plenty of coffee onboard. Improvisation becomes an important skill for the ship’s cook–to make do with what you have. Rotating foods and re-purposing leftovers into something tasty are essential. I must say these guys do a wonderful job of putting on a sumptuous, nutritious meal four times a day every day! In addition to the great meals, Darrin is a pastry chef whose baking fills the ship with the delightful scents of cakes and cookies. Darrin shares that when baking on a ship you must rotate what’s in the oven often or it’ll come out lop-sided! I’m also impressed that we are still having fresh green salads at this point in the voyage. Harry relates that he buys lettuce in whole heads and keeps them cold. This enables him to get at least two weeks of good out of the fresh produce. A cool, dry place for storage of potatoes, carrots, beets and squash is in the fore peek hold located in the ship’s bow. Every nook and cranny of the ship is used for something! No wasted spaces here. Good quality food and skilled meal preparation is very important on a lengthy voyage—for the health and overall morale of the hard working people on board the R/V Norseman II. Hmmm….. I wonder what’s for lunch? I really can’t express the wonder and awe that I feel when getting to view the creatures from the deep. Seeing pictures is just not as good as seeing them in person and getting to hold them in my hands. They move and creep along exploring their new environs while Dann and Kasey and I take photos. With each new batch I get another wonderful science lesson from one of the scientists explaining the life cycles, behaviors and importance of these animals! Many of you will be happy to know that after their “glamour shots” most of the animals are returned to the ocean. So, I just found out that I get to go out on the next dive boat! Yay! 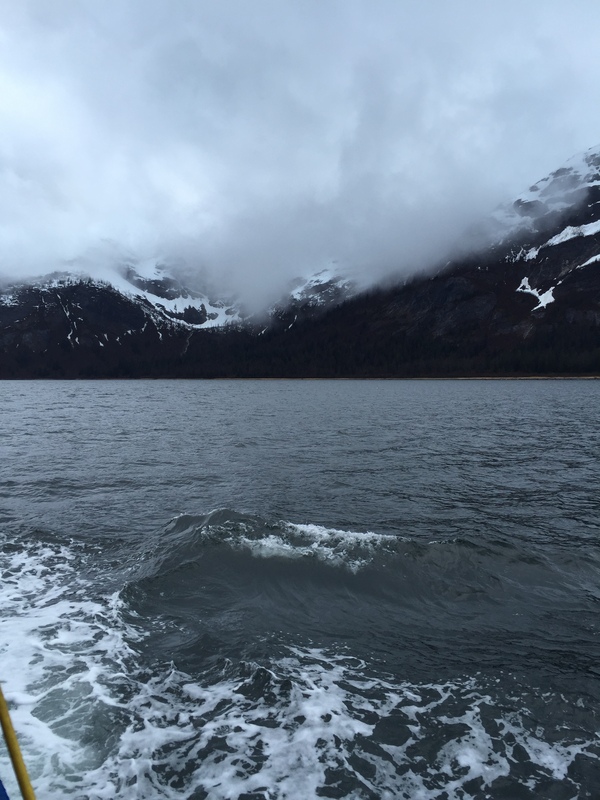 This entry was posted in 1990-2002, 2016, Mary Cook 2016, NOAA Teacher at Sea and tagged Alaska, coral, glacier bay national park, Mary Cook, Norseman II, Ocean Exloration. Bookmark the permalink.